Newt Gingrich was punked today by the political action group The American Bridge 21st Century, which bought NewtGingrich.com, and is selling it for $1 million or the highest bid. The URL re-directs to negative articles about the GOP frontrunner, and to Tiffany’s, where he ran up a $50,000 tab, and to Greek Cruise Lines, among others. 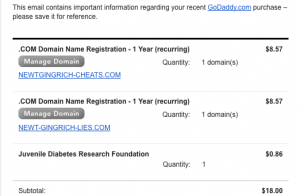 And I just bought Newt-Gingrich-Lies.com and Newt-Gingrich-Cheats.com – both of which I’d be happy to sell for a minimum bid of a mere $150K each. We are 30 years into the Internet Age, and it is mind-boggling that none of the geniuses surrounding the candidate for President of the United States had the smarts to reserve every negative URL anyone could possible think of about Newt. No-Newts.com is available too, if you want to buy it. There seriously is no excuse for this level of ignorance. But hey, this is a fun game. Do Join in!